Next to their wide range of unvented type paraffin heaters Toyotomi is the only company in the world to manufacture also a range of paraffin heaters with evacuation, the so called FF-type heaters which stands for “Forced Flue” venting system. This 100 % Japanese technology can heat rooms with big volumes up to 450 m³, without bringing the exhaust gasses into the room. 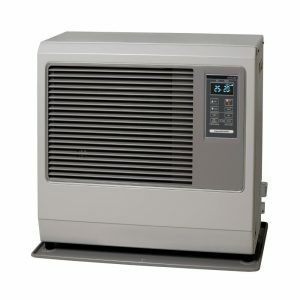 In fact these heaters are provided with a “pipe-within-a- pipe” forced flue venting system, which is very easy to install. Just a small hole in the wall, whether it concerns wood, brick, masonry or even metal as found in industrial buildings, is needed to connect the outlet duct to the outside of the house. 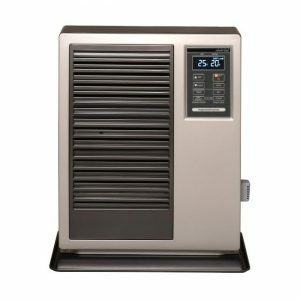 This venting system allows you to install “sealed” high capacity paraffin heaters ranging from 5 up to 9,5 kW safely located in closed areas, without the need for ventilation but still with the economy and comfortable heat that paraffin can provide. 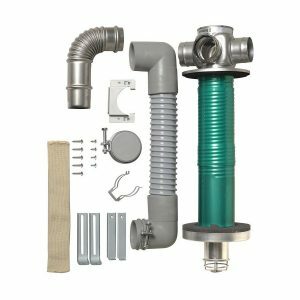 The internal structure of the venting system consist of an outer pipe which brings in cool outside air needed for the combustion, while the inner pipe will exhaust all the warm gaseous combustion products through the heat exchanger to the outside. Pre-heated air will increase the efficiency of the combustion which is bringing the internal heat exchanger to high temperatures. 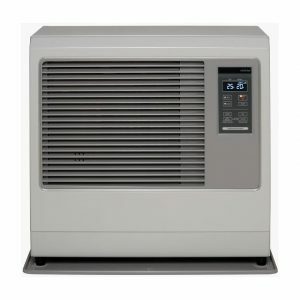 In the process, a large and silent circulation fan is forcing the room air to pass through the warm heat exchanger and distributing clean heated air in a quick and even way into the room. 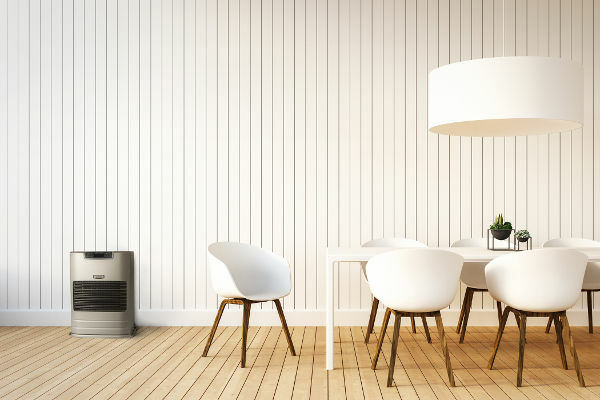 The result is smokeless, odorless, clean and comfortable warm air being pulsed into the room by means of a safe, highly efficient and economic heating system. Laser Burner technology: the FF laser heater is one of the most fuel efficient heating systems in the world today. Its special stainless steel heat exchanger offers a 92 % efficiency, giving you all the convenience of a central heating system. Automatic operation: the FF laser heater features a simplified digital control panel that displays room temperature, temperature settings, clock and error codes. When the temperature is set with the thermostat, the heater automatically selects one of the 4 burning modes (high – medium – low – OFF) to reach and maintain the required temperature, while at the same time managing maximum fuel efficiency. Flame sensors, detecting if the heater is ignited or not. Error codes will be displayed in case of failure and the heater will be stopped automatically. Overheat protectors, detecting if the heater has abnormal high internal temperature, caused by any reason for example when the fan has a malfunction or stopped working. Power failure recovery system: if at any time a power failure occurs during operation, the FF laser heater will automatically restart when the power returns, keeping track of the initial heater program settings. 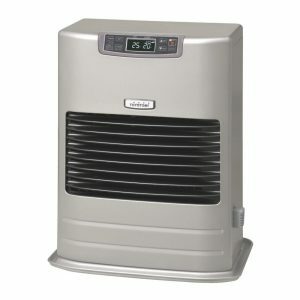 In fact the operational status of the heater is automatically stored in the internal memory of the heater. There are 2 different models of FF laser heater; certain models (FF 30 T / FF 55 T) are provided with a removable fuel tank, which can easily be filled with the manual fuel syphon pump which is provided. Other models (FF 30 – FF 55 – FF 95) can be connected to an external fuel tank with large capacities (up to 300 liters), providing also a large autonomy. FF laser heaters are fully programmable through a multifunctional easy to operate panel. The functions are controlled by a microprocessor and it offers a constant reading of different indicators like set temperature, room temperature, fuel level but also a very convenient weekly timer. The weekly timer can be programmed up to 30 different patterns within a 24-hour period of the week. It is designed for ultimate comfort and energy efficiency by shifting automatically to a low burning mode, generally at night. 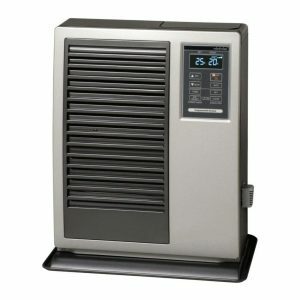 The FF laser heaters are designed to heat large volumes in an efficient and economical way. They are very easy to install just a small hole through the wall will be needed. It is the best heating solution for caravans, mobile homes, holiday houses or different rooms in your house not being served by central heating. The FF laser heaters are designed to run on standard paraffin (or kerosene as it is called in the US) but are also adapted to run on sulfurless high grade “home fuel” (depending on the product specification). There are actually 5 different models available, each with different capacities or fuel tank systems. Each model is provided with a standard “venting system/duct set” , but there are many accessories available to enable different installations.